It was supposed to be the weekend of their lives – three days on Henry Island at an exclusive house party. Best friends Meg and Minnie each have their own reasons for wanting to be there, both of which involve Kamiak High’s most eligible bachelor, T.J. Fletcher. But what starts out as a fun-filled weekend turns dark and twisted after the discovery of a DVD with a sinister message: Vengeance is mine. Usually I don’t search out scary books to read. I’m normally a wimp when it comes to the scary - whether in print or movie form. But, sometimes books come along that surprise me and even begin to sway me towards a genre I wouldn’t normally read. Well, last year one of those surprising books was Possess, which had a great balance of scary and not so scary. And to be honest, the scary has been growing on me, a little. 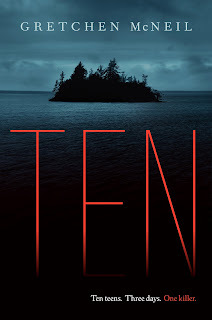 So once I heard about TEN, I knew that it would find its way onto my 2012 To-be-Read list. Despite my (shrinking) aversion to scary stories, I love a good twisty, turn-y mystery, especially one that keeps you on your toes and guessing until the end. Gretchen McNeil deftly combines mystery with smallish touches of horror in TEN, to create a just right blend of genres that kept me hooked from the first page. One of my all time favorite mysteries is And Then There Were None by Agatha Christie. After reading the synopsis, my first thought was that it sounded similar but with teens and a modern setting. 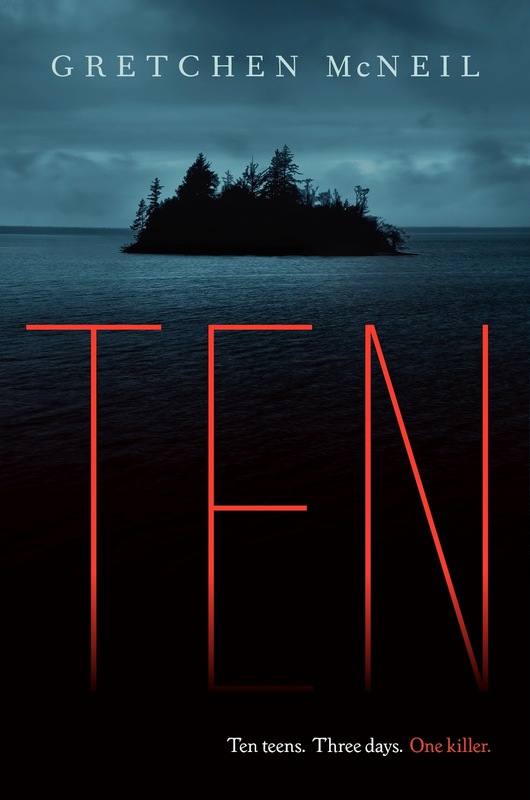 And while Ms. McNeil pays homage to Agatha Christie, TEN is thoroughly her own creation. Details about Henry Island, White Rock House, the DVD with its creepy and menacing message, the raging storm and the killer’s eerie method of communication all add to the reading experience. Upon finding a DVD labeled “Don’t Watch Me,” Minnie says, “This is how horror movies start.” (ARC, pg 58) A few times, I did want to warn the characters to remember Minnie’s mention of horror movies, in a you might want to think about your next move type of way. But, Minnie’s statement could also be about the book too, because several of the scenes were very vivid and began thinking about how they would look on a screen. The third person narration from Meg’s point of view really helped to keep up the suspense. And I like how she was kept away from the action several times, so that the reader experienced the fallout with her. Though in the second half of the book, there were some pieces of information I felt Meg received too late, that if they had come earlier in the book, they would have made more of an impact to the story. This is where the length of the book plays a factor; the just less than 300 page length did not feel sufficient. It left me with some questions, the most persistent was how the killer could organize the entire weekend and all the different pieces that had to be put into place to make it work out the they wanted it to. But, maybe the reader isn’t meant to know that. Not knowing the answer didn’t really impact my enjoyment of the book, but I can see how some readers may find not having the answer a bit troublesome. Overall, TEN did keep me reading. I found Meg to be an interesting choice for the point of view character, with her writer’s observations, and the third person narration did help to move the story along at a good pace. I ended up liking the more gruesome scenes more than I thought I would. I found red herrings and twists fun in that they did keep me guessing as to the killer’s identity and they led to a conclusion that had a few unexpected bits. To me, those are the best type of conclusions. Fans of thrillers and those who enjoy a good (twisty) mystery will enjoy TEN. And of course, if you liked Possess, you should pick up this book too. 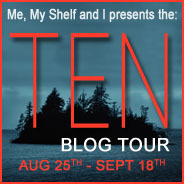 You can find out more about The TEN Blog Tour by visiting Me, My Shelf and I.